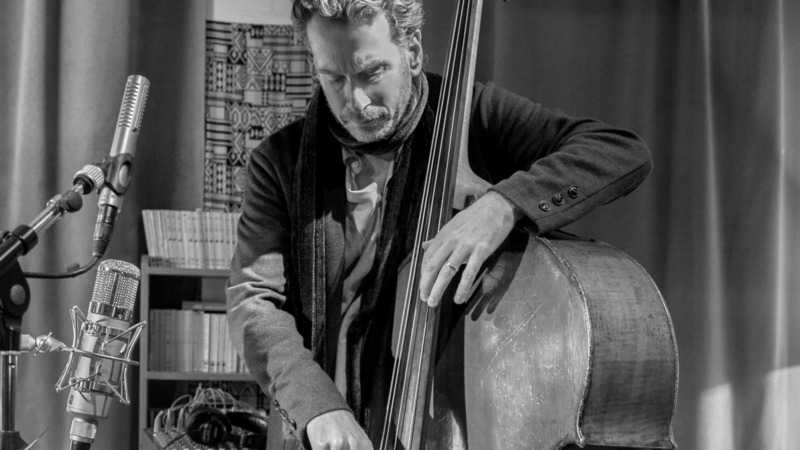 For the past three decades Larry Grenadier has earned a stellar reputation as being one of the top jazz bassists in the world. From his early days playing with Stan Getz and Joe Henderson to tenures playing with Paul Motion and Pat Metheny (among others), Grenadier is an in-demand musician who is highly collaborative, intuitive, and virtuosic in any context that he finds himself playing. He is probably best known as a member of the Brad Mehldau Trio but also co-leads the cooperative group Fly with Mark Turner and Jeff Ballard. Most recently Grenadier recorded and toured with the quartet Hudson featuring John Scofield, Jack DeJohnette and John Medeski. Although featured on hundreds of recordings, Larry has embarked on his first solo bass project titled The Gleaners for ECM Records. We caught up with him in between touring to ask him about his new project. (Jazz Online) What led you to record a solo bass project? (Larry Grenadier) Manfred Eicher suggested it a couple years back. I thought it would be an interesting challenge. The whole project took me on an interesting musical journey as I began formulating how I wanted to have the music take shape. It made me dig deep into larger concepts like sound, timbre, space and touch and how I could use the double bass in different ways to create a set of music that had variety. Was recording a solo album something that you had always wanted to do as a bassist? I had never really thought about making a solo bass record. I had grown up with a few solo bass recordings that I had really enjoyed by Dave Holland, Miroslav Vitous and Gary Peacock. Later I became aware of the bassist Barre Phillips’ solo recordings. All of these records were done for ECM with Manfred Eicher. But there were other inspirations for solo playing besides bass records. Of course in the classical realm there is a trove of amazing music written for solo string instruments. Besides Bach’s suites for cello, I was inspired specifically by Benjamin Britten’s solo cello music and Paul Hindemith’s pieces for solo viola. The clear difference between solo bass and solo piano or guitar is that the bass, for the most part, speaks one note at a time. The logic of the line unfolds over time while a piano or guitar can stack notes simultaneously. This presents different challenges as a composer and player. Was all of the material on The Gleaners written specifically for this project? Most of the material that I wrote was composed for this recording. The one song of mine, “Pettiford,” had been written a few years back for Fly with Mark Turner and Jeff Ballard. Other pieces were adapted for solo bass. “Compassion,” by John Coltrane, is from his Meditation Suite which has always been an inspiring record for me. That song is connected to a piece by Paul Motian, “The Owl of Cranston.” I was lucky to have played with Paul quite a bit over the years and was very influenced by his way of playing freely in time but with a pulse. “My Man’s Gone Now,” from Porgy and Bess, is a song I’ve always loved, especially the version by Miles Davis and Gil Evans. The guitarist Wolfgang Muthspiel offered to write a couple of short solo bass pieces for this recording and I was very happy with the way they came out. They really pushed my technique. And my wife Rebecca Martin wrote the song “Gone Like the Season Does.” I’ve been fortunate to be her musical partner as well for many years and have learned so much from our musical collaborations. This is one of my favorite songs of hers. What is the greatest challenge in recording a solo bass project? The challenge in recording a solo bass album was at first conceptual. How did I want to go about doing it. I decided early on not to do a record with a lot of overdubbing. This could have been one approach. I wanted to try to do most everything live in the studio with just one track of bass. This made me explore different techniques like alternate tunings, double stops, and of course changing between arco and pizzicato playing to create as many sonic variations as I could. So what started as conceptual challenges became technical issues that forced me to practice! What are your impressions working with producer Manfred Eicher? I couldn’t really imagine doing this record for anyone else. I have worked with him over the years on many different projects. His ears are huge and the breadth of his musical knowledge is very wide. He also really knows what the double bass should sound like so I trusted him completely in the process of making this album. Are you looking forward to performing this material live? I am definitely looking forward to performing this material live. I want to see how some of the songs will develop in front of an audience. I also want to experience the sole responsibility of bringing the listeners on a solo bass ride for an evening. The challenge of making it an interesting journey for the audience is a challenge I am ready to accept.